In this century, as our nation appears on the verge of a (mostly, so far) non-shooting civil war brought about by cultural battles and an attempt to overthrow a sitting president, Americans wonder: How did we get into this mess? It's axiomatic that one of the best ways to find one's way out of a bad predicament is to understand how we got there in the first place. 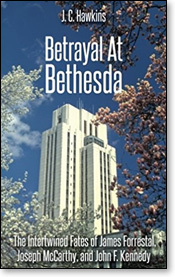 Herewith comes an information-loaded analysis titled Betrayal At Bethesda. The book gets right to the heart of how it is that – just having defeated Hitler and Imperial Japan – we ended up having "won the war and lost the peace." And with a focus on the period of the late forties until just before the dawn of the riotous late sixties, author J.C. Hawkins explores highly suspicious deaths of three leading voices who fought back against the encroaching poison of Marxism. This time, the threat came from "our noble ally" (so termed by FDR), Joseph Stalin. While the U.S. had been working (with the help of Britain & France) to make "West Germany" a free democratic society, the Soviet Union's sector was in the process of becoming "East Germany," a hostile territory and Soviet-controlled outpost of a "noble ally" that had stormed through Eastern Europe to replace the Nazi threat with its own communist threat – one grip as tight as the other. A good part of this Pollyanna attitude was the result of naiveté, American optimism, and a willingness to see what we wanted to see. Those innocent attitudes were encouraged by forces not so innocent. Our "noble ally" had, both during and following the war, infiltrated our highest councils of government and related influential institutions, where they pushed an agenda that worked to the advantage of the Soviets. Principled and courageous voices in Washington pushed back in the Post-War period. Three in particular are highlighted in J.C. Hawkins' new book, whose full title is Betrayal At Bethesda: The Intertwined fates of James Forrestal, Joseph McCarthy, and John F. Kennedy. The author is a Princeton graduate, with a long career as a business executive steering communications campaigns for some of America's biggest companies. Mr. Hawkins says the shared vision of those three men, and the suspicious circumstances of their deaths, caused him to explore the likelihood that "three of the most heinous crimes in American history may have occurred at "the same place: the National Naval Medical Center in Bethesda, Maryland, just outside the nation's capital over a fourteen year span." And he goes on to explain how character assassination followed beyond their graves. "James Forrestal [Defense Secretary in the Truman administration] carries the label of mentally disturbed individual who killed himself. 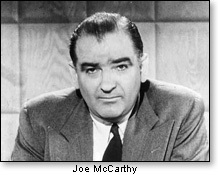 Joe McCarthy was besmirched as a witch-hunting drunkard and bully. 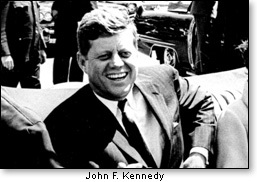 John Kennedy endures a second assassination, this time of his character because of shortcomings in his personal life." Betrayal At Bethesda explains how "beginning with Forrestal's death,...both McCarthy and Kennedy were heavily influenced by that event, and how the demise of McCarthy ultimately had a great impact on the life and fate of John Kennedy." Forrestal served as an inspiration and mentor to the two younger men, McCarthy and Kennedy, who had come to Washington as among the fresh-from-war veterans elected to the 80th Congress – the "class of 1946." McCarthy, as a freshman senator, had been invited to a lunch with Forrestal, perhaps because the secretary saw the new senator as a "fighting marine veteran who had seen war up front and was willing to listen to information as to how our post-war policy of looking the other way in the face of Soviet perfidy would lead to disaster." (Later in 1949 just before his death, Forrestal would predict that our men would be in a fighting war the following year. 1950 was when the Korean War broke out.) 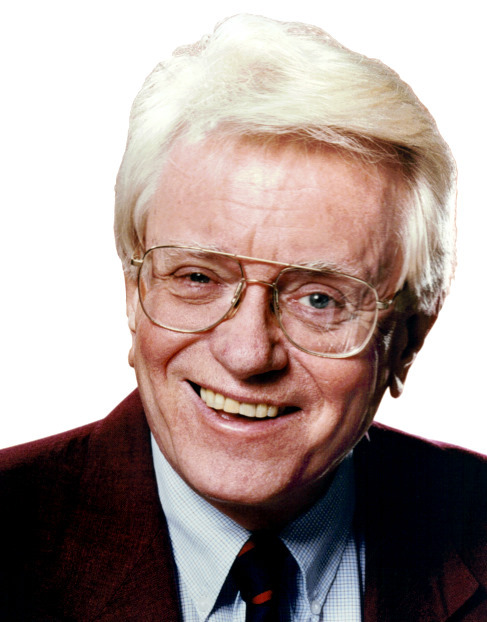 One of the warnings Forrestal gave the new senator from Wisconsin was that if some of our leaders merely made mistakes, they would occasionally make one in our favor. Forrestal first met John F. "Jack" Kennedy through a prior business and friendship with the latter's father, Joseph P. Kennedy. Young Jack, having previously enlisted in the Navy, ended up as a commissioned ensign in the Naval reserve. He was then assigned to the Office of Naval Intelligence in Washington, D.C. While there, he got to meet Secretary Forrestal. After Kennedy's return from the Navy and his recuperation from injuries suffered during his rescue of the crew of PT 109, young Kennedy signed on with the Hearst News organization, and as a reporter, accompanied Forrestal on a flight to Germany. Forrestal was headed for the Potsdam Conference of victorious war allies. Author J.C. Hawkins says that the trip "proved formative in molding Jack Kennedy into a staunch anti-communist." Defense Secretary Forrestal served in both the Roosevelt and Truman administrations, including his time during World War II. His work and responsibilities, first as Navy Secretary and then in the top job at DOD, spanned 9 years with no real vacation time, and at war's end he was worn to a frazzle. His extreme fatigue was exacerbated by the unrelenting attacks upon him for his insistence that the U.S. faced a deadly threat from the Soviets and left him well beyond the point of sheer exhaustion. The Hawkins book is not the first to probe honestly the death of Defense Secretary Forrestal. But the tremendous service this newer volume provides is its addition of mountains of new research and badly needed updating and reinforcement of historical truth that survives decades of repeated false hopes and powerfully motivated attempts to keep this history buried forever. 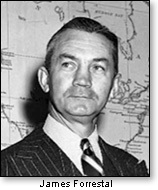 Earlier, author Cornell Simpson had written the text of what would eventually become The Death of James Forrestal. That text was written in the mid-fifties. Its publication did not come until 1966. Publishers had earlier rejected it as "too controversial." Then you may wonder why it takes so long for plain truth to emerge into the public square. Forrestal "catapulted" from his room on the 16th floor of the hospital. My own suspicions as to whether James Forrestal's reported "suicide" was for real were aroused when Westbrook Pegler wrote a series of columns chastising rival columnists Drew Pearson and Walter Winchell for hounding then Defense Secretary Forrestal while the latter lay on his sick bed at the medical center. In today's revelations by J.C. Hawkins, the 21st century writer has investigated not only the suspicious circumstances surrounding Forrestal's death, but also the curious combination of errors following the passing of Joe McCarthy and Jack Kennedy. The autopsies and conclusions of the deaths of all three did not pass the smell test. And all three of the faulty analyses as to cause of death happened at the same place: the Bethesda Naval Medical Center in Maryland, just outside of Washington, D.C. Something has to give that so much lack of proper analysis could happen to three Americans very much in the public eye. Scandal is hardly the word that applies here. We think today that the idea of scandal is an incumbent administration dispatching the FBI to plant a spy in the presidential campaign of the opposite party, and it surely is. What then to make of three front-line public figures whose violent deaths are wrongly analyzed in a famous hospital at the foot of the nation's capitol? That prompts some questions, even after all these years. Among those are issues raised by Senator McCarthy, as quoted in Betrayal At Bethesda: "The Communists hounded Forrestal to death. They killed him as definitely as if they had thrown him from that sixteenth story window in Bethesda Naval Hospital. We know there was a celebration in the Communist headquarters in New York that night." Beyond that, McCarthy – had he lived – might have followed probes that would tear the wraps off the kind of chicanery cited by Benjamin Fischer, chief historian of the CIA, who, according to Hawkins, wrote that the agency during the Cold War recruited hundreds of double agents from the Soviet Union, East Germany, and Cuba who passed on false intelligence to senior lawmakers. Or this comment from the late author Ralph De Toledano, who says McCarthy confided in him that he was investigating what he termed the "murder" of General Patton at the end of World War II, an unsolved suspicious car "accident" to which this column has referred. The OSS (CIA forerunner) and the British counterpart MI-6, according to the senator, were involved n the plot. As the world knows, theories about John F. Kennedy's murder – or who or how many were really involved – persist to this day. Some likely deserve to be debunked. But others hang around, and are based on unanswered questions and situations that just don't square with some conclusions arrived at by the Warren Commission, which was ordered by President Johnson, fearful that any Soviet fingerprints found on President Kennedy's assassination would embroil the United States in an all-out World War III. While any president's concern of all-out war on that scale may be understandable, the twisting and suppression of history ad infinitum need not be tolerated. Hawkins, for example, cites the sounds of shooting, perhaps some simultaneous, that clearly leave open the probability of more than one shooter. And – once again – he cites the work done once Jack Kennedy's body was flown from Dallas to the Washington area where the body was examined at (again) Bethesda Naval Medical Center. Questions the author raises include: Why did the JFK autopsy mask the wounds witnessed by so many? How were JFK's wounds altered or hidden? There is much more, all found in Betrayal At Bethesda. The adage that "the past is prologue, look to the past" has relevance here. There are things out in the open after apparently being covered up today that in an earlier time we could not imagine. Perhaps a hidden history was our "prologue."